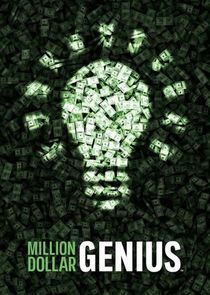 Million Dollar Genius reveals the incredible true stories of ordinary people who started with an idea and, through hard work and perseverance, transformed their ideas into wildly successful products. Some of the stories covered include the creator of the Java Jacket, a simple cardboard coffee cup holder we all use today, the inventor of Rollerblades and the person who made millions from his idea for a collapsible garden hose. Along the way, we uncover the secrets of their successes, from the initial light-bulb moment right through the development and eventual marketing of each idea. Every story has its own unique twists and turns, as well as insights into the mind of each inventor, revealing how each overcame seemingly insurmountable obstacles to become a success. Each hour contains multiple stories that are not only aspirational, inspirational, and identifiable; but they are also packed with plenty of drama and big money payoffs. Josh Springer creates Bottom's Up, a dispenser that fills from the bottom; Bruce Johnson makes the adhesive strip called Breathe Right that helps people breathe easier.